Let’s start with a confession: I’ve never reviewed a Gvibe product before, but it’s by no means a new company. It’s actually the latest incarnation of Fun Toys, which then later became FT London. ‘Gvibe’ is the result of another rebrand in early 2018, due to the realization that many consumers associated the brand with its best-selling, eponymous, dual-ended stimulator, the Gvibe. No matter the name, I’ve always perceived the brand and its products to be vibrant and fun. And despite the Gballs 2 kegel exerciser being released two years ago, I still wanted the chance to try it out as a comparison against newer devices. So I did. The Gvibe Gballs 2 packaging is quite uniquely shaped compared with other brands, as the items come in cylindrical boxes, with a paracord carrying handle. The shape of the box makes them really strong and a good size for storage. The overall design is fairly toned-down and elegant, being mostly white with a grey design, with the usual product and app images on the side. The cardboard is a nice matte finish, with any imagery or branding picked out in a shiny gloss effect. The first impression is a decent mid-to-high level item which would appeal to a broad demographic. The lid of the box is held on by hygiene seals and lifts off once these are broken. Within the box is an instruction guide, a USB charger, a white satin drawstring travel/storage bag, and the Gballs 2 itself, nestled into a sponge collar. The Gballs 2 is bright pink and shaped like a very curvy, small bowling skittle. It’s very plain in aspect, having a small button and LED near the bottom of it just by the antenna/retrieval cord, which is the same colour as the main body. The antenna/retrieval cord is really very sturdy and I wasn’t worried about it snapping at all. One thing I liked about the design is that the Gballs 2 is flexible in the centre, allowing for easier insertion than a product that is rigid. The whole item is pretty compact in size, measuring 82mm in body length, with an additional 105mm for the antenna/retrieval cord, and 31mm in diameter. The silicone is soft and smooth, and miraculously seems not to be a complete dust magnet, as is woefully common with decent quality silicone. The materials of Gballs 2 are body safe, being made of ABS and medical-grade silicone. The whole unit weighs only 54g, but as the focus of the kegel training is on vibration and not weight, it shouldn’t matter. Gballs can be used independently of the app, by just switching on using the button near its base. The first mode is the “squeeze for vibration” mode, which uses touch sensitive technology. As the name suggests, this activates the vibration by squeezing the pelvic floor muscles, and cuts off when the muscles are relaxed. I found this to be very responsive – there was no delay at all when squeezing and relaxing my kegel muscles. It was instantaneous and probably my favourite function on the device. If the button is pressed a second time, this activates the “sustained vibration mode”, which is also as it sounds; a continuous vibration. As the product is silicone, it must be used with water-based lubricant. I liked the general feel of Gballs 2, it was comfortable to wear, the vibration was mid-range and very pleasant for the most part. You can customise the intensity within the app, and I have to say I found the highest setting to be a little bit on the buzzy side, rather than rumbly, but it was still a nice sensation. Gballs 2 is really simple to clean as it can be submerged in water for a good wash with soap and water, or any toy cleaner. Gballs 2 actually came with some charge, but it’s always advisable to charge products before use just in case. The pin of the charger inserts into a silicone dimple right near the base of the item, this isn’t easy to see, but it is clearly displayed in the accompanying instruction leaflet. The charger has a USB fitting so can be slotted into a PC, laptop, or a plug. The LED glows red while Gballs is charging and switches off once a full charge is achieved. For an hour’s charge I got around 4 hours of use, which is exactly what the information leaflet stated. 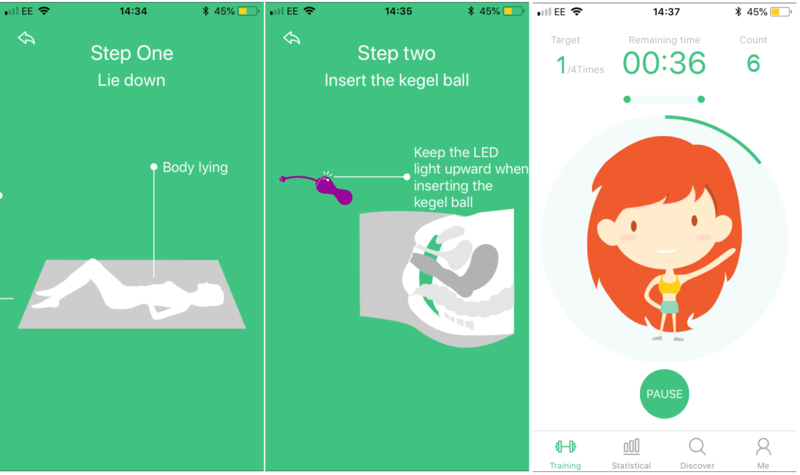 In order to get the full use of Gballs, you need to download the Magic Kegels app, available from the App Store and the Google Play store. It’s very quick and easy to download and install, following the instructions. Alas, the app controlled portion of the Gballs is where it fell apart for me. I liked the initial look of the app itself. It’s quite cutesy and attractive (although some of the wording seems to be almost in broken English, and there’s a glaring spelling error – the word History is spelled ‘Histroy’ on the training page), and I liked the statistics page and the training history very much. I think the ability to track your progress is a fantastic idea and one I was very much looking forward to using. There is also an inbuilt calendar to track your menstrual cycle, which may come in handy for some users, if you don’t already use an app for that. There’s a very sweet plant graphic which displays your progress by growing; it doesn’t have much practical benefit, but it’s a nice touch. I’m not certain if I was just unlucky, but I wasn’t able to maintain a connection between my phone and Gballs 2 for long enough to complete a single training sequence. I completed the first few minutes and discovered that despite my best attempts I wasn’t logging any progress at all. Upon closer inspection I realized that it was because the device kept disconnecting. I tried going to different locations in the house, I tried holding my phone closer to the device, nothing seemed to work for me. I was disappointed because I thought Gballs 2 had a great deal of potential at being an item I would use regularly. If this summary was based purely on my experience as a standalone (not app-controlled) item, I would definitely recommend Gballs 2 at a lower price point – it feels really good and I love the touch-sensitive aspect of it. Unfortunately, as I couldn’t get it to remain paired much of the time, I would struggle to wholeheartedly recommend it if that’s going to be your primary method of control, and certainly not at $110 (£79.99). Perhaps go check out the We-Vibe Bloom instead. Product Description: The early first signs were good for the Gvibe Gballs 2 kegel exerciser - and if you never switched on your phone to try to control it, you'd probably find it a fine device. However, we had extensive disconnection issues during testing, which makes it hard to recommend at $110. The early first signs were good for the Gvibe Gballs 2 kegel exerciser – and if you never switched on your phone to try to control it, you’d probably find it a fine device. However, we had extensive disconnection issues during testing, which makes it hard to recommend at $110.